It is our philosophy that our pieces will stand the test of time – in terms of design as well as quality. 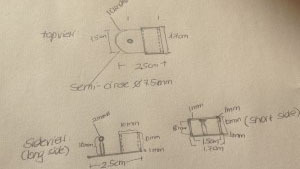 Every new piece begins with a scribbled drawing and – after a few iterations – it is turned into an actual piece that can be manufactured in small numbers. 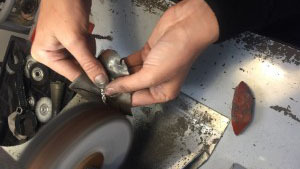 Our jeweller is based in Hatton Garden/ London making the metal and stone pieces by hand using traditional techniques. Each stone is hand picked and sourced from a stone trader in London. Each piece is hallmarked by the London Assay Office and carries the maker’s mark ‘MMzS’. Our leather craftsman is also based in London and makes the leather components according to our designs. He has over 10 years of experience working in the workshops of Italian luxury handbag manufacturers – and virtually unlimited patience. The exotic leather used in our pieces is sourced from suppliers that adhere to the Convention on International Trade in Endangered Species of Wild Fauna and Flora (CITES). 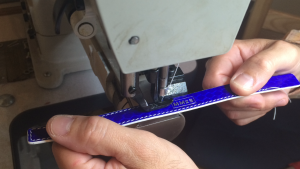 All our leather pieces are embossed with the ‘MMzS’ Logo. Our designs are registered with the Intellectual Property Office of the United Kingdom and are protected by international copyright laws.